I have a confession to make. When it comes to watching the Big Game in our house, the night is definitely more about food and commercials than it is about football. And what goes better with watching sports than eating pizza? 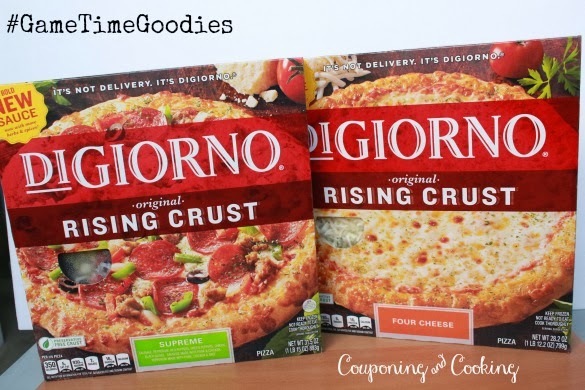 Trying to order delivery can take forever when big football games are on so we always like to keep a few DiGiorno Pizzas on hand in the freezer for when we get hungry during game time. When it comes to having people over to watch sports, I hate being stuck in the kitchen prepping and making food which is why the ease of frozen pizza is perfect for game time. 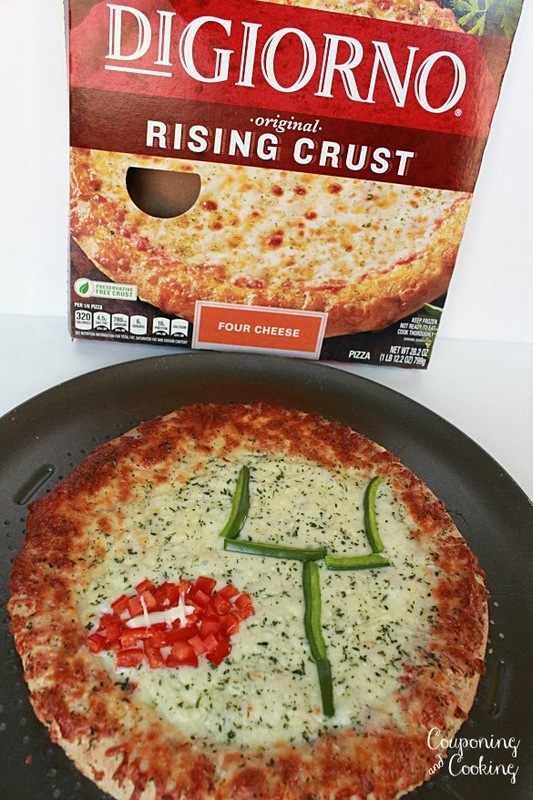 I love DiGiorno pizzas just as they are right out of the oven but for a big football game I thought it would be fun to dress it up a bit. 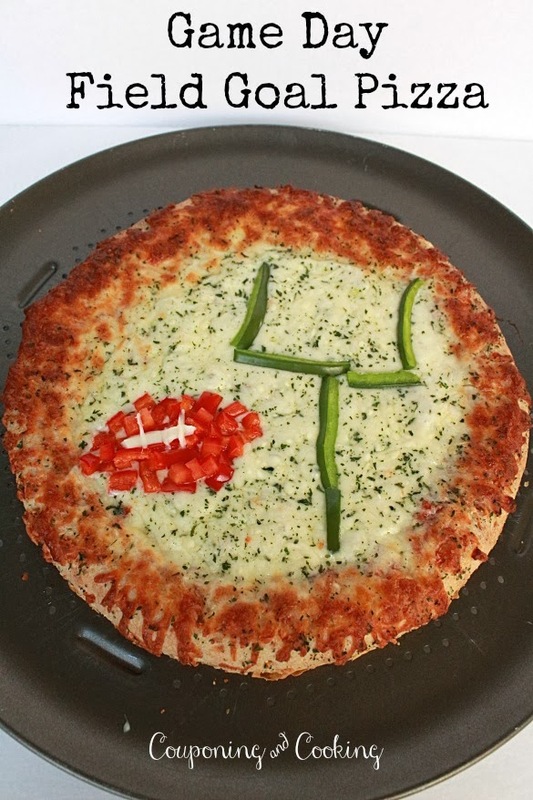 These fun, football themed pizzas are so easy to make they only took minutes to put together. And all the needed toppings can be chopped and cut ahead of time and be waiting in the fridge for when it's time to eat. For the Field Goal Pizza, I started with a Four Cheese DiGiorno. I used sliced green peppers for the goal post and made the football out of chopped red peppers with string cheese for laces. Everything went on the pizza (except the string cheese) before it went in the oven so when it came out after 18 quick minutes it was ready to serve. 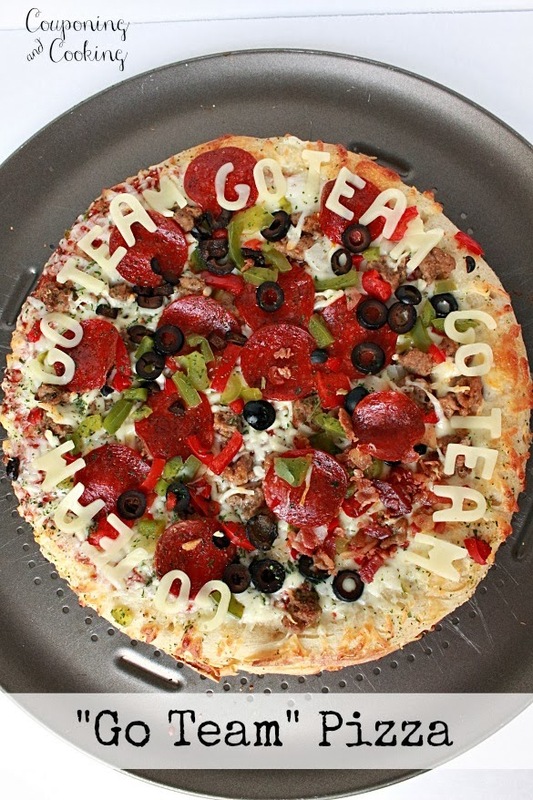 The "Go Team" Pizza took a little long to prep but it can be done earlier in the day to save you time during the game. I started with a DiGiorno Rising Crust Supreme pizza and baked it according to the instructions on the box. 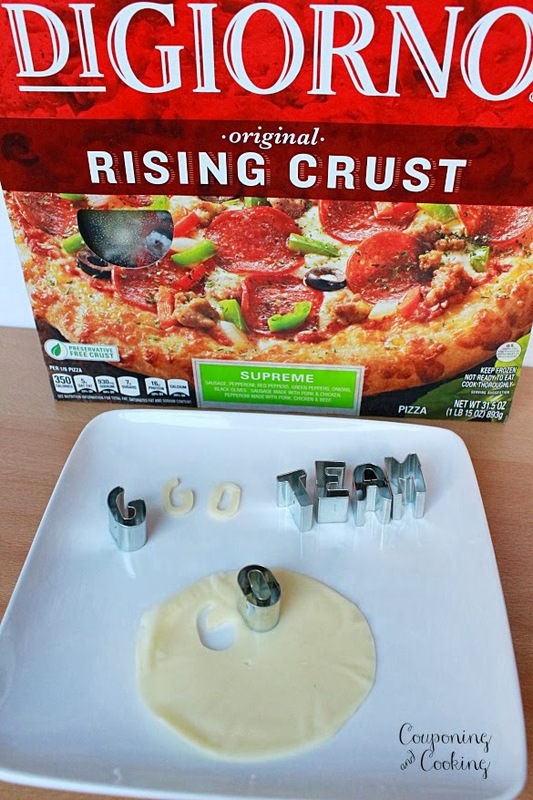 Using small letter cookie cutters, I punched out letters from slices of provalone cheese to spell "Go Team". 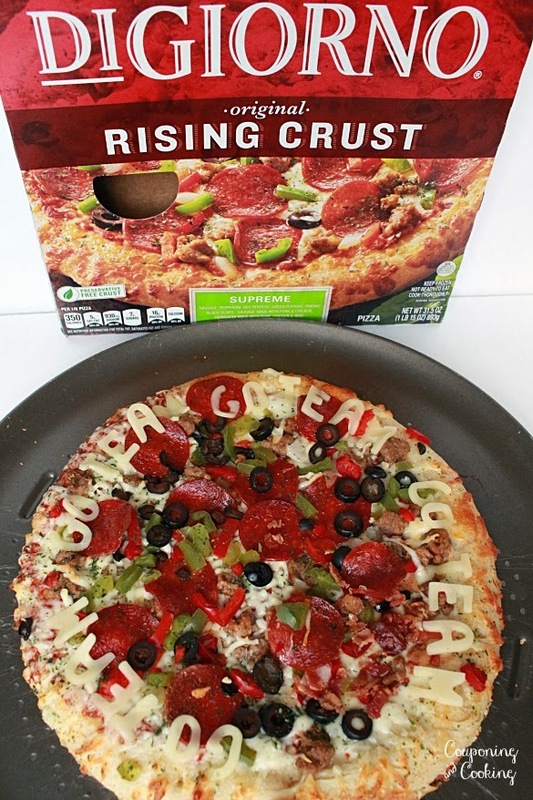 Once I took the pizza out of the oven, I placed the letters around the crust of the pizza for a cute and fun way to dress up an already delicious looking meal. You can personalize these for all kinds of sporting events and even for your favorite team. Ready to make your own? 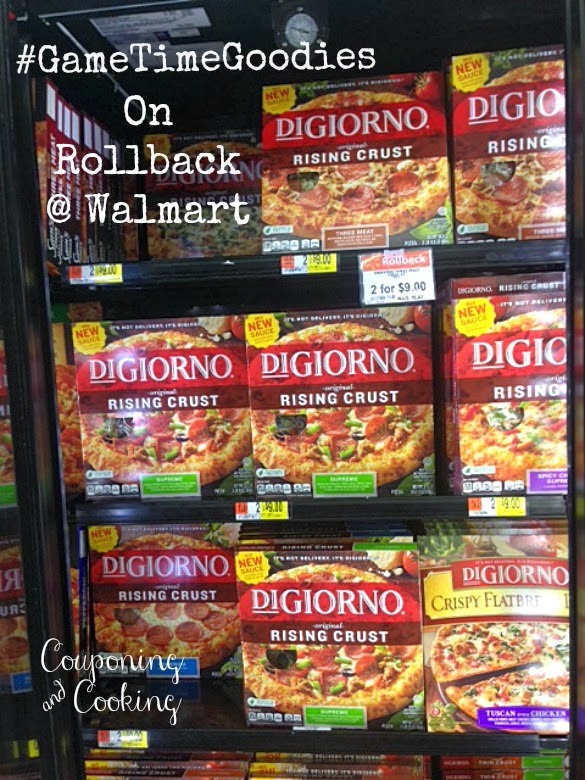 You can stop by your local Walmart and grab a few DiGiorno pizzas and take advantage of the current $4.50 Roll Back pricing just in time for the Big Game!